And also changed mainFrameStyle TargetType=”toolkit:TransitionFrame”. 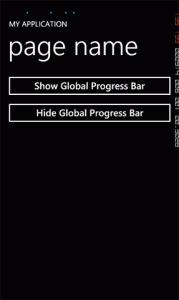 Do you have any suggestions, or how to add global progress and keep pages transition working. Off the top of my head I couldn’t tell you what the problem is, sadly. The TargetType of the style doesn’t need to change since anything that derives from the target type can still use the style (so for this reason it’s best to target the lowest level class you can). I suspect there’s something wrong with the template itself, I’ll have a look around later and see if there’s anything obvious. In the meantime I would highly recommend using the WP7Contrib transitions instead of the Toolkit. They’re much faster and save considerable amounts of memory (40MB on the app I’m working on). 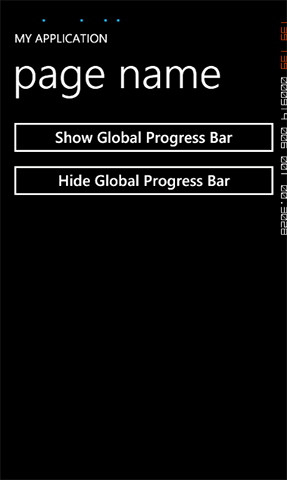 They also work well with the global progress bar. I’ll be writing a blog post on easily implementing the transitions in the coming days. Now that’s an excellent and straight forward example, works like a charm.